Getting a reservation at Brooklyn’s Lilia (the airy, gorgeous, industrial-chic Italian hotspot in Brooklyn’s Williamsburg neighborhood) is no small feat. But if you’ve been lucky enough to taste renowned chef Missy Robbins’ dishes, you may have noticed one thing: It’s not your standard spaghetti and meatballs. Of course, that’s due to Robbins’ own extensive and ultra creative background (combining skills she picked up in Italy and a background in eclectic, New American techniques). But it’s also due to another factor: Her background with Weight Watchers. As the executive chef of two Michelin-starred eateries, it might be surprising that the Top Chef: Masters alum uses the eating program in her personal life. Even more surprising? The influence has spilled onto the techniques she uses at one of Brooklyn’s most popular outposts. And trust: She does mean differently. As a culinary expert, Robbins is at the forefront of cool, forward-thinking techniques and flavor combos—and using Weight Watchers has actually expanded that innovation. Below, find out how Robbins stocks her own kitchen for healthy meals on the fly, and how Weight Watchers has fueled her healthy evolution. 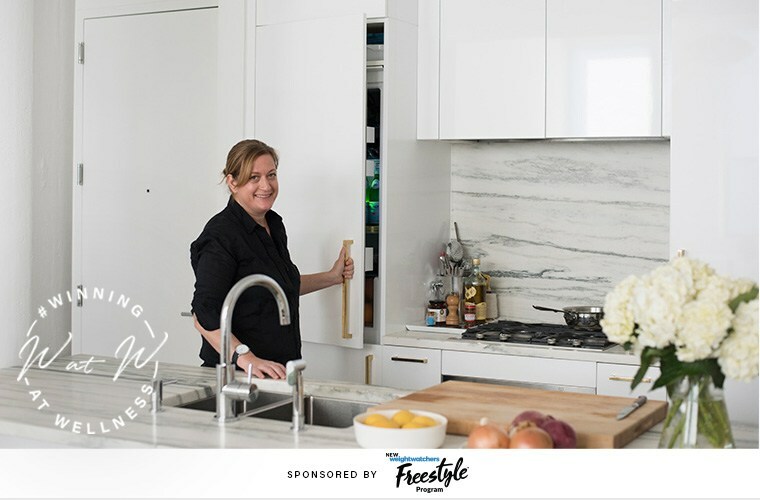 Scroll down to see what’s inside Lila chef Missy Robbin’s kitchen—and how her healthy journey has impacted her cooking game. Tell us how you started using Weight Watchers. I knew I was overweight. I had started doing Pilates, and I was doing it three times a week and I could feel myself getting stronger, but I wasn’t losing weight. When you lose five pounds in a week, it feels like a lot and it feels encouraging. So I kept at it. I was 198 pounds. I had an ankle problem that wasn’t just because of my weight, but I did physical therapy and ever since I’ve lost the weight, it’s gone. Which is pretty amazing—it’s never come back in two years. How do you reconcile cooking Italian food—which is a lot of olive oil and pasta—while using Weight Watchers? It was really hard for me at the beginning. An appropriate portion of pasta is two ounces to get away with not having a crazy amount of Points. I weighed out two ounces of pasta—and I mean, normal people eat like half a pound of pasta. Our portions in the restaurant are five ounces, but a two ounce portion of pasta is really small. And the other really cool thing that happened during this time was I figured out ways to use other ingredients to enhance sauces. So instead of using a lot of olive oil to sautee garlic, I would add tomato paste or I would use water with anchovy paste. I started to rely more on spices and other things rather than olive oil. So I think when you you focus on how to make something more flavorful using citrus and herbs and other things, you stop focusing on what you’re missing. I don’t feel like I’m missing anything when I eat this way. Meal prepping is key in a restaurant. How do you do that at home? Meal prepping at home just makes life easier. I just decided I’m going to start making really big batches this winter of sauces and chicken soup (which always makes me happy to have around). On Sunday I just made this awesome bean soup that provided five meals for me. One day I did it with an egg on top, one day I added Pecorino on top, one day I added smoked paprika. If I have tomato sauce in the house, I know I can always make my eggs in purgatorio, which is eggs in spicy tomato sauce. When I’m trying to eat really healthy, I eliminate pasta altogether and I eat a lot of bean and green stews in tomato sauce. What kitchen staples do you always have on hand? With oranges and lemons, I use the zest and also the juices. I always have a lot of red wine vinegar around. I use anchovies for everything: I use them in sauces, on their own, to enhance vegetable dishes in vinaigrettes. I always have garlic and extra virgin olive oil around. You should try and always buy olive oils from the harvest. Right now, the new harvest is about to come out for 2017, and then you want to stop using 2016. The fresher the olive oil the better. I keep a lot of seasonings: Chile flakes, fennel pollen, fennel seed, coriander seed. A lot of herbs, too: Thyme, rosemary, parsley. I have an awesome recipe in my book for Bolognese, which replaces pork and veal with ground turkey. I like making turkey meatballs. In any recipe where you have ground beef, ground turkey is a great substitute. Now you’re trying out Weight Watchers’ new program, WW Freestyle, which has more than 200 zero Points® foods (like chicken, eggs, fish, and tons of fruits and veggies) you can eat. How’s that going? I think it’s kind of cool, because free is a great word. It makes a lot of things open to you and it makes you have to think a little bit less about what you’re cooking. Like last night I was at work and I was hungry, so I just had scallops. I just had grilled scallops with these marinated peppers we do and it was virtually, besides a little bit of olive oil that was in the dish, almost like a zero-point meal. It allows you to still cook in a manner using olive oil, because the olive oil becomes a point that you’re not worried about because you’re not using Points for the actual protein. [Weight Watchers] has been a life-changing thing for me, and I think I will use it for the rest of my life. I never want to gain weight to that point again—I never want to feel like that again, I never want to look like that again. And this for me is what worked.